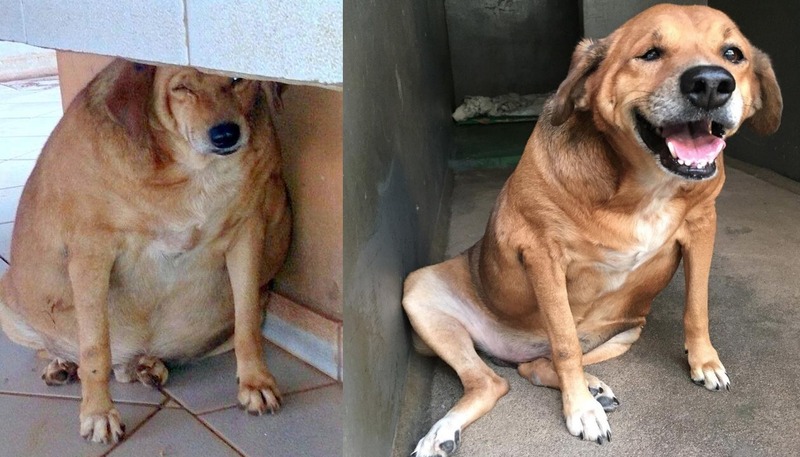 Weight Loss of the Day: This Brazilian Stray Pup Has Quite the Transformation After a Kind Clinic Takes Him in - The Daily What - Daily Dose of WHAT? Abandoned in an old gas station, he came to be known as Bolinha, which means pellet or ball in Portugese. He was the 'mascot' of the nearby restaurant/gas station, until Roger Oliveira brought him to the organization. The physical therapy they gave Bolinha had to be slow and began in water to make it easier on his straining joints. With his new regimen and his new friends, Bolinha began to lose weight! After 20 days, Bolinha lost 6 pounds. Down from the 80.5 he had when he came into the clinic. But Bolinha kept at it and kept losing weight. After six months, he was looking a lot better! After a year, Bolinha lost over 30 pounds! Of course, charitable clinics like this need all the help they can get, so maybe stop by their Facebook page and say hi! Raining Nope of the Day: There are Seriously Skydiving Spiders in South America. Burn the Earth.